Will The Real Jucy Lucy Please Stand Up! Make a normal sized hamburger patty and place 2 slices of fresh American cheese and 1 slice of Swiss cheese and as much chopped onion as possible on top, then add another hamburger patty and carefully seal the cheeses/onion inside. In a large heavy skillet place each burger and cook. After turning once, poke burger with a toothpick to let out steam, taking care NOT to lose any cheese (this is the tricky part). Cooking a 1/3 pound burger without letting the juice, cheese and onions run out takes talent! Serve on a buttered bun with all the condiments! For me, that is a true Juicy Lucy! Place beef, Worcestershire sauce, garlic salt, and pepper in a bowl; mix well. Portion into eight even balls of meat. Shape each portion into a thin round patty that’s slightly larger than the cheese slice. Fold cheese slices in half twice, so you have a little stack of quartered cheese slices. Place a folded cheese stack on four individual patties, covering cheese with remaining four patties. Tightly crimp the edges of the patties together to form a tight seal. Did you make a tight seal? I hope so, because it needs to be TIGHT to avoid a blowout as the cheese melts and creates steam. The cheese will try to find its way out of its meaty prison! Preheat a cast-iron skillet or heavy-bottomed pan to medium heat (or fire up a medium-hot bed of coals on your backyard grill) and cook burgers over heat 3 to 4 minutes on first side. 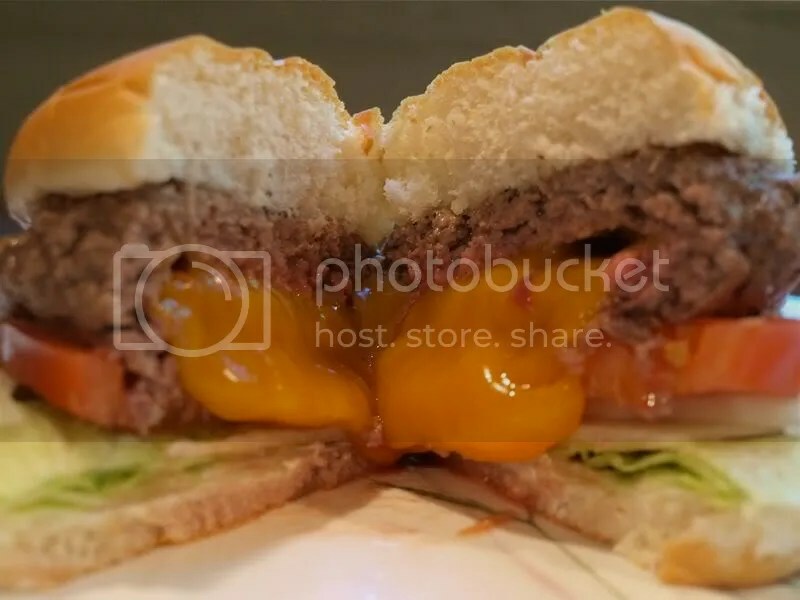 Burger may puff up due to steam from melting cheese. This is normal. Do not be alarmed. Flip, and using toothpick, prick top of burger to allow steam to escape. Allow burger to cook 3 to 4 minutes on this side. Remove patties from pan or grill. Bun those suckers, slap some condiments on, and dig in. 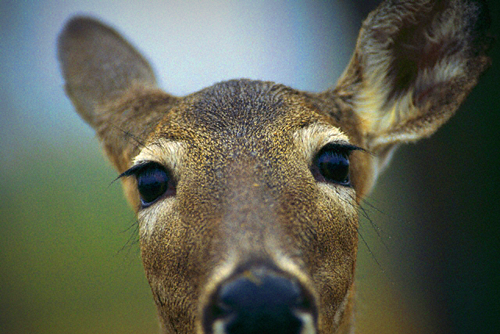 Other suggestions I may offer….If you have ground venison, go right ahead and give it a try. But, you better add ground pork, so those edges will pinch together and hold as you flip your burgers. Plan to protect your garden first. Rabbit, mole or deer problems? You need to plan around them! For instance, around the outside of a flowerbed, use a good groundcover spreading type of flowers like sedum, woodruff, or phlox to protect other animal attracting bulbs like tulips. Meat tips: On refreezing meat, you can refreeze meat that has been thawed in a refrigerator, the problem is home freezers are slow to freeze, so make sure to put package well into the back of the freezer as you can. Ice crystals form in slow freezing, these crystals rupture cell walls of the meat, permitting juice to escape during cooking. A great way to help add moisture is to soak a meat in water, like a whole roast or ham, for 1 to 2 hours before cooking and decreases cooking time. On the grill add an ice cube to tin foil covered meat or vegetables for moisture. If lean meat is needed in your diet, trim off fat from beef and skin from chicken or turkey, it can take away from moisture. Wild meats: Bear, deer heart, roasts, etc, marinating for 24-hours in water and herbs can really add to the taste and take away from the wild taste. Include herbs like: ground sage, bay leaves, garlic, thyme, parsley, salt, pepper. To get creative with marinade add in things such as: chili powder, tarragon, wine, vinegar, ketchup, lemon, soy sauce, or onion. Turmeric and curry can be used in marinating for exotic taste. Marinating can take as little as 2-hours, 24-hours for jerky, and up to 48-hours, depending on taste. Use a clean wooden cutting board, this will not dull the knife, a plastic board can chip off small pieces of plastic into food. Always store raw meat on the bottom of the refrigerator so juices won’t leak onto other foods.